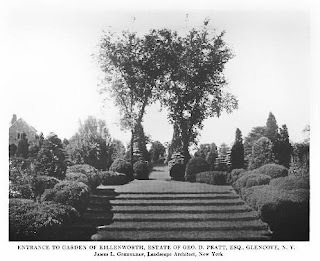 The entrance to the garden at 'Killenworth', the George du Pont Pratt estate designed Trowbridge & Ackerman c. 1913 in Glen Cove with landscaping by James L. Greenleaf. Click HERE for more on 'Killenworth'. Photo from the Annual Exhibition of the Architectural League of New York, 1922. Turf steps. Very high maintenance indeed. Sometimes its the simple things.